Enter Cathy Gale: 'Warlock'. Dave Rogers. Nineteen pages. 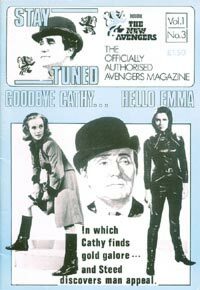 A precis of 'Warlock', the first Cathy Gale episode of the series, followed by press reaction and the evolution of the show until Honor Blackman's departure in early 1964. Vengeance Is Whose? Philip Purser. Two pages. Undated reprint of a piece from 'Television'. Who Wants To Go Out And See A Bad Picture When You Can Stay At Home And See One? Barry Norman. Half a page. Reprint of a piece from Blackpool Evening Gazette, October 17th 1987 re a potential Avengers film. Look, Stop Me If You've Read This, But... Graham P. Williams. Three pages. Regular opinion column. Curry A La Carte. Stephen & Joy Curry. Two pages. Regular information on the current activities of various Avengers luminaries. Motoring: Avengers Style. Part Three: 'End Of The Road'. Geoff Barlow. Three and a half pages. A look at the vehicles used in the show by Cathy Gale, Tara King, Mike Gambit and Purdey. The Avengers. Things You Always Wanted To Know - But Were Afraid To Ask! Uncredited. One page. Selection of Avengers trivia.